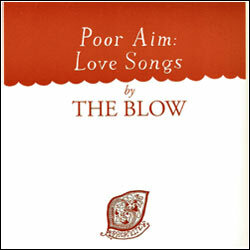 The first in the Pregnancy Series, The Blow's Poor Aim is a concept EP dealing with misdirected love, failed love songs, and love's failings. Poor Aim is a commanding pop statement - or "hit factory," as we're affectionately calling it - with song after glorious song of striking dance floor brilliance. A rapid-fire RIL assault certain to be blow-up the playlists of iPod DJs nationwide. Give it a spin - we're sure you'll agree.